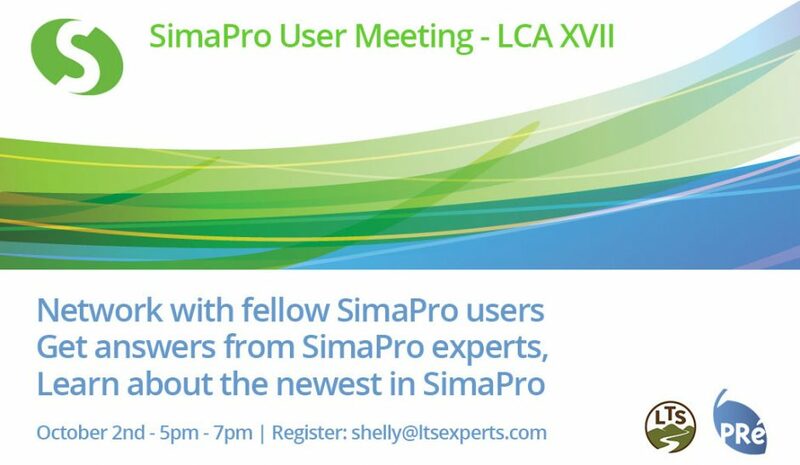 Join LTS and PRé for our second annual SimaPro User Group Meeting on October 2, the evening before the LCA XVII Conference. This is an opportunity to network with fellow SimaPro users, get answers from SimaPro experts, and learn about the exciting new SimaPro options. The landscape of LCA is expanding beyond just the LCA expert as more departments and stakeholders want to use LCA results. An investigation with our partners and SimaPro users led to the understanding that an increasing number of companies are looking for custom tools that can help them easily construct and share LCA models across departments. These insights led PRé to develop a number of new SimaPro tools and options that help share LCA results and analysis with business users. This allows the data to come to life by giving users the ability to ask questions and manipulate scenarios. The session will include live demos of these new tools and options available for SimaPro customers, followed by questions, discussion, and feedback by meeting attendees. This is a unique opportunity to learn about the future plans for the software SimaPro, network with other SimaPro users, and share your ideas and suggestions. Monday, October 2nd, from 5pm to 7pm (local time), before the ACLCA Conference. RSVP only by email, contact Shelly Severinghaus.